Sometimes you don’t have your life together for a Monday post, it happens! It has been a crazy week at work. Every time someone comes up to my desk, it is for a new project for me to work on. I love the pace and all that work just means job security and great things for my company, so bring it! Still though, I am worn the slap out at the end of the day when I finally arrive home and have to go through the nightly routine of cooking for Zoe, having a quick playtime, getting her bathed and clothed and ready for bed….then cooking our dinner and eating and doing dishes and trying to wind down for the day. This past weekend was wonderful. I kicked it off Friday, trying out a new to be place for breakfast, Great Harvest Bread Company. I had the most delicious blueberry cream cheese scone and toffee latte!!! 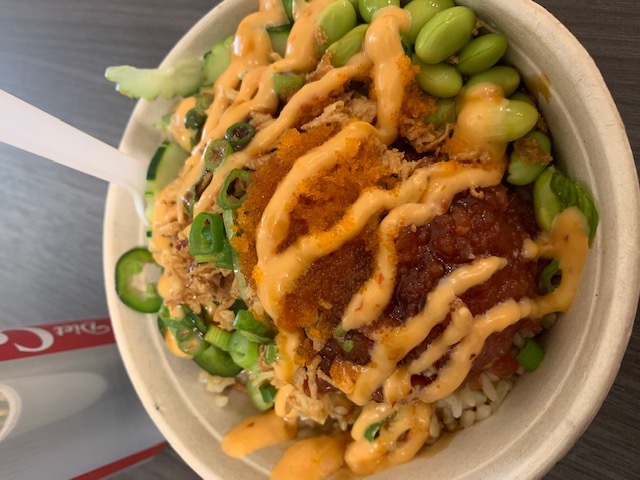 I decided to take myself to lunch on a nice walk to Ono Poke for a Spicy Tuna Crunch Bowl at lunch. It was DELICIOUS!!!! Saturday, Chris had plans to go to a LAN party at my BIL’s house to beta test a new video game that comes out in March. My mom called me last minute and asked me if I could meet for lunch, YES!!! 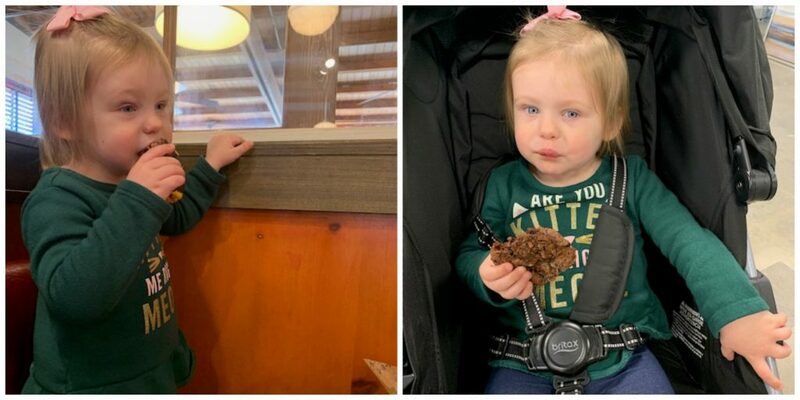 Zoe and I met up with her and we did some shopping, ate a delicious lunch at Jim n’ Nicks and even took Zoe to get an American Cookie Company cookie. We had so much fun!!! Zoe was really sad when it was time to part ways, she cried “My Grandma!!!! !” the entire way home. It makes me so happy to see her so excited about her family though. Burgers and cookies make her happy too! Sunday we did our grocery shopping, and after Zoe’s nap we headed over to Bargain Hunt and grabbed large diet cokes from Sonic for the drive home. I scored a major deal at Bargain Hunt on some shoes!!!! 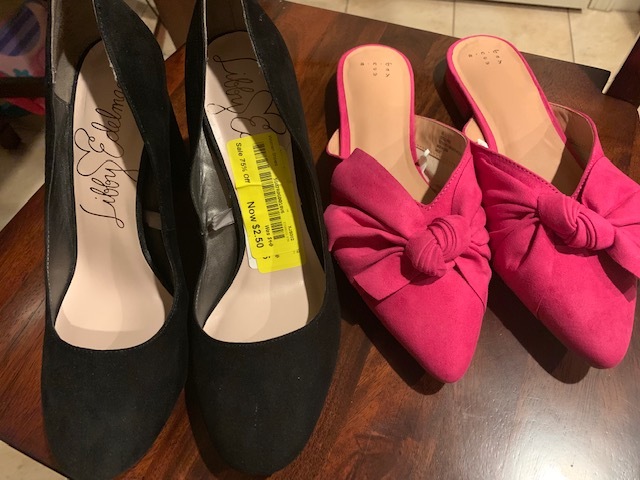 I got the black pair for $2 and the pink for $3. Brand new, never worn, tag still on shoes from earlier in the season from Target and JC Penney. SCORE! In other news, I was sad to get a text from my dad on Saturday saying that America passed away.My sister and I got America for my dad for a fathers day present 11 years ago. She was a sweet sweet girl and we found out a few months ago she had a tumor and it took her a bit too soon. RIP sweet Miss America! It Has Been 6 Months!? Yay for a deal on shoes and weekend talk on a Wednesday…I am here for it! Sometimes Wednesday needs SHENANIGANS. I am sorry about America. Gentle hugs to you and your dad. I am so sorry about America! What a pretty doggie. That tuna poke bowl looks so delicious. I’m glad life is swinging along and that you love your job! I am so sorry to hear about your dog. Breaks my heart. I love that you always score amazing deals on shoes. They never have my size in the clearance shoes at Target and I have never really tried JC Penney’s. I can’t believe how big Zoe is getting. Those scones look yummy and Zoe has the most beautiful eyes. Im really sorry about your dog. So heartbreaking to lose our furry friends 🙁 . Oh no, I’m so sorry to hear about America. She was beautiful!! I’m glad you had a nice weekend though, other than that. It’s great Zoe loves her grandma – that’s too cute. And mmm…I could go for a cookie right now!! Oh man… I always get so sad to hear of any family pet that passed away. Love her name too! 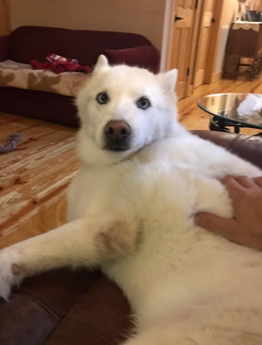 Sorry about the loss of the sweet dog! I need to check out Bargain Hunt. You always find the best deals! That bowl looks DELISH! I’m so sorry to hear about the loss of your Dad’s dog, and what a sweet gift that was to him 11 years ago. Zoe always makes me smile and I really wish we had a Bargain Hunt, bc those deals are AMAZING! I love Poke! So sorry about your dog. Aww so sorry to hear about your dog! !